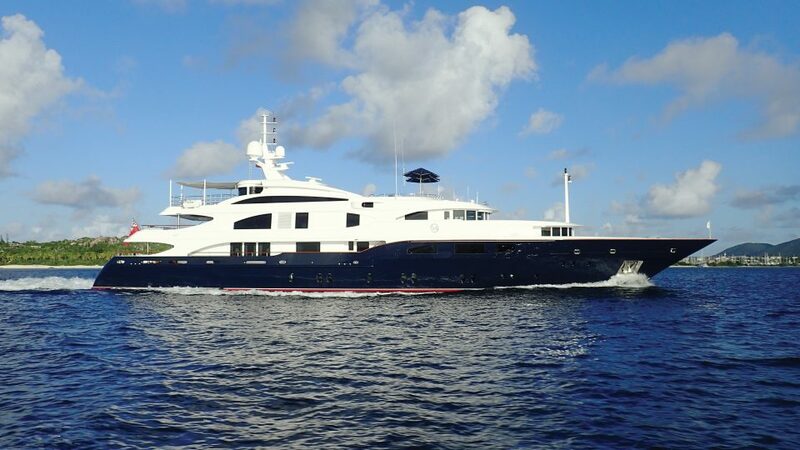 Merle Wood & Associates is pleased to offer the LADY MICHELLE mega yacht for charter. With accommodations for up to 12 guests in 6 luxurious staterooms, her main deck master suite opens to a private study and also features a raised, forward observation lounge. His-and-hers en suites feature a marble-clad Jacuzzi, and is enveloped by rich, dark woods. Guest staterooms include 1 king VIP on the bridge deck, as well as 2 queens, and 2 twin staterooms on the lower deck; all are equally well-appointed and feature their own en suites. Formerly CAKEWALK, we are pleased the yacht will stay on the charter market with us as LADY MICHELLE. And, we are delighted to report that this exceptional mega yacht will be available in the South Pacific beginning January 2018. Do not miss the opportunity to charter a vessel of this stature while she is in French Polynesia. The LADY MICHELLE yacht for charter boasts an interior and exterior design by the renowned Stefano Natucci, who chose a tasteful, modern design with neutral hues and pops of color. Her main salon is surrounded by large windows, and peppered with comfortable soft furnishings that are neutral in color. The formal interior dining area boasts a large, rectangular glass table surrounded by high-backed, cushioned wooden chairs. Up top, the skylounge is equally plush, and has grouped seating, as well as a bar. Aboard the LADY MICHELLE mega yacht for charter, deck spaces are generous. Her sun deck features a forward Jacuzzi and plenty of sunpads on which to relax, as well a gym with large windows for those seeking a workout while on the ocean. Boasting a large outdoor dining table and chairs, the upper aft deck is ideal for al fresco meals, while built-in bench seating borders its perimeter. A host of water toys includes diving equipment, waterskis, kayaks, fishing equipment, and more. Powered by 2 Caterpillar 3512 engines, she is capable of cruising at 14 knots, and tops off at 16 knots, while zero-speed stabilizers offer added comfort to guests. With over a decade of experience as a luxury yacht charter broker, Kevin Greene has access to the worldwide yacht charter fleet, which includes yachts that are not publicly available. For additional information, read the full LADY MICHELLE yacht for charter specs and details.